Singaporean food is well known for being both inexpensive and amazing, but if you don’t want to seem kiam siap (stingy), or if you just want to escape sweltering heat, there are pricier versions of our favourite cheap eats that are perfect for dining out with clients or foreign friends. It’s up to you to decide! Nasi Lemak is flipping AMAZING, don’t let anyone tell you otherwise. Abandon your diet plans, throw all caution to the wind, and tuck into fragrant, coconut-flavoured rice topped with delish sambal chili, a fried egg, deep fried ikan bilis and peanuts, and a couple of deep fried chicken wings or pan fried fish for good measure. Feel free to add on other goodies like otah, stewed vegetables, or fried fish balls at some of Singapore’s favourite haunts: Boon Lay Power Nasi Lemak if you’re in the west, or Ponggol Nasi Lemak if you’re in the east! A large plate with multiple add-ons will only cost you $5 at most – you really can’t go wrong with either one. Want to enjoy Nasi Lemak in a more atas, air-conditioned environment? We have TWO retro-style restaurants for you to visit! The Coconut Club and SINPOPO both exude a fun, classic, old-school charm (totally Instaworthy), and are perfect for your weekly #tbt post! A plate from The Coconut Club will set you back $12.80, and a sharing plate of fragrant Nasi Lemak for two at SINPOPO is $28, but we promise they’re both worth it. The fragrant rice is cooked to perfection and served alongside chunky sambal chili (YUM) and everything else that comes with a great plate of Nasi Lemak. Singapore seems a little nuts for coconuts, and for good reason – rich, mildly spicy coconut broth is what makes laksa so incredibly indulgent and irresistible. I know Singaporeans are INTENSE about which bowl of laksa truly takes the cake, but these three are my personal favourites. Head down to 328 Katong Laksa, Roxy Laksa or Sungei Road Laksa (I can’t narrow down my list any further, I’m sorry) for a slurping good bowl of noodles that’ll only cost you $5 at most, even if you add on extra noodles, cockles, and other goodies. Now, if you want to splurge, Beast & Butterflies at M Social Singapore has a fresh take on the classic dish. Featuring smooth, thick mee tai mak (or lao shu fen/rat noodles) instead of the standard fare, it will run you $16. Chatterbox serves up an extravagant bowl of Lobster Laksa, complete with thick vermicelli, quail eggs, fish cakes, dried beancurd, and a whole Boston Lobster simmered in spicy coconut gravy! No, that’s not a typo. A delight for sure, but also something that will set you back $36. Worth it? For the relaxing ambience and those hearty mouthfuls of sweet, succulent lobster flesh drenched in laksa gravy – definitely. Okay, real talk, this is the ONE thing I look forward to having every time I head home from a long trip overseas. There’s honestly nothing more comforting than sitting in a noisy kopitiam and shoveling fragrant chicken stock (and fat) infused rice in my mouth – and one of my favourite places to get it is from Wee Nam Kee Chicken Rice. You can’t go wrong with their smooth, tender pieces of chicken and flavourful grains of rice. I’m not a rice person, but trust me when I say that I’ll lick this entire plate clean. Wanna have it somewhere fancier? Chatterbox strikes again with their award-winning Hainanese Chicken Rice – enjoy your tasty plate of goodness for $32 in a beautiful, relaxing 5-star hotel. Beautifully barbecued chunks of meat on a skewer? Sign me up! It was all my Swiss friend’s lovely family would talk about when discussing Singaporean food in the middle of winter when we were busy having raclette, and for good reason. It’s really a genius way to enjoy meat, especially when it’s dunked in a bowl of satay sauce full of peanutty-goodness. Get some amazingly affordable satay at Chai Ho Satay or Fang Yuan Satay, where a skewer will only set you back 50 cents AT MOST. Talk about a value for money! 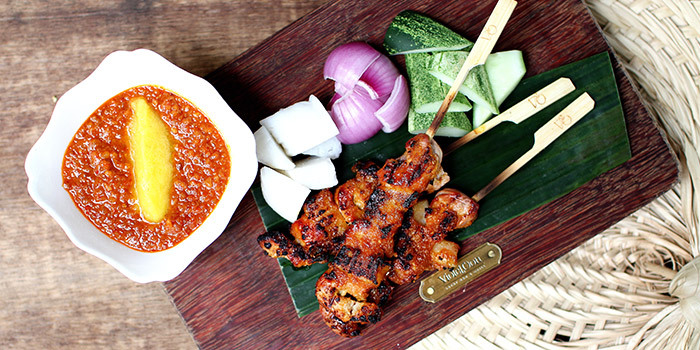 Violet Oon Satay Bar & Grill is the place to be for slightly more extravagant fare. The restaurant is absolutely beautiful and furnished in rich greens and polished oak, with handpicked vintage-looking decor that’ll bring you back to the good ol’ days. You can get three skewers of Angus Beef Satay for $18 that are tender and full of smokey goodness – pricey, but there’s a reason why people keep coming back for more! Hill Street Fried Kway Teow has queues that stretch on for miles (ok, slight exaggeration) and you’ll understand why after an arduous 30 minute wait. Their $4 Char Kway Teow has incredible wok hei and is the most fragrant thing EVER (my mouth waters just thinking about it). It’s greasy and sinfully good, full of cockles and noodles doused in the sweet and salty dark soy sauce, and makes you feel like you need to run 5km just to unclog your arteries after inhaling a plate (or two, I won’t judge), just the way a good plate of Char Kway Teow should be. It’s affectionately called a heart attack on a plate for a reason! Kopi Tiam Swissôtel The Stamford has a great plate of wok-fried goodness for $18 that’s chock full of fresh prawns, cockles, and fish cakes. The restaurant is also furnished to look like a real kopitiam right out of the 80’s (complete with a wooden signboard), except you’ll be enjoying your plate of greasy, fried goodness in air-conditioned comfort – a welcome respite from Singapore’s heat, that’s for sure! This dark mixture may seem a little daunting at first, but it’s one of Singapore’s most beloved desserts. Made up of black glutinous rice (which gives the dessert a satisfying, slightly chewy texture), creamy coconut milk, and gula meleka for a sweet, nutty fragrance, this sweet dish is sure to please your inner sweet tooth. Get your fix from Lit Lit Sin Cold & Hot Desserts, where dessert prices range between $1.20 to $2.30 – a value for money for sure! Alternatively, you could head to National Kitchen by Violet Oon for a fancier rendition of the popular Nyonya dessert, this time topped with a generous dollop of coconut ice cream ($12). If this isn’t the best way to #treatyoself, I don’t know what is!